CoilyQueens™ : Red Palm Oil and Afro hair care. Oil therapy is practiced with the Coily Queens Regimen. Carefully selecting specific natural high quality oils for your hair type and hair issue. Massaging those oils onto your scalp for 10 minutes daily. Being sure your hair strands are lubricated daily with the right high quality oils. Done correctly, it will eliminate your single strand knots, greatly reduce tangles and increase your hair growth rate. Red Palm Oil is a new addition to the Coily Queens Regimen. Check out the amazing benefits this oil provides for your hair. I started using red palm oil last year. I purchased my jar from a high end grocery store; it was an impulse buy. My palm oil is unrefined, organic and comes in a dark glass jar. Red palm oil is full of vitamins A and E, and is knows as a super food. When purchasing any type of organic oil, you need to use it consistently. Organic oils are made to be used and not stored. Even though I used it 3 times a week,my jar expired before I was half way finished. Check your expiration dates before you pay for it. 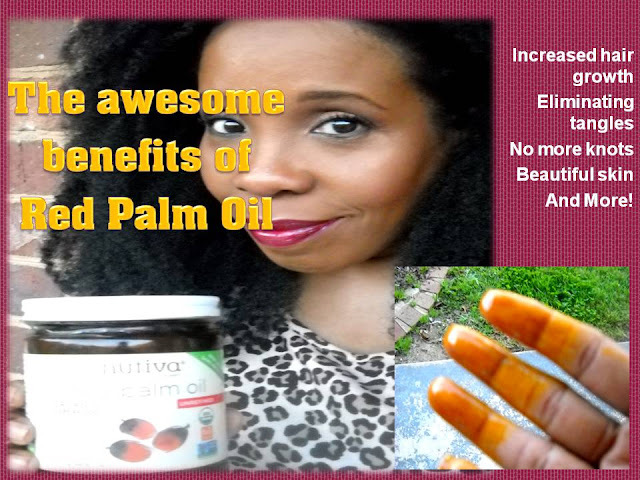 Red palm oil is very rich and a little goes a long way. Red palm oil is great to use right after your shampoo regimen, because it locks in moisture so well. Consistent use will reverse your gray hair and correct hair loss. Red palm oil is full of carotene and lycopene and this prevents your hair from becoming weak or brittle. Full of saturated fats and lipids makes it a perfect moisturizer for the hair and skin. Contains a high amount of vitamins A and E, more than any other plant oil. Less than $1 per ounce, great price! This oil is a bright orange color. Some people feel the oil is messy and stains. Personally I do not find the oil messy. I always wear a scarf if I use it at bedtime. As with all oils I measure out my oil, instead of just eyeballing it. I use the finger dip method instead of pouring it from a applicator bottle. Taking these measures ensures that you do not over oil your hair. It does not stain my clothes, pillows or furniture. I would recommend every other day. It is very rich and it stays on your hair well. Start with a little and add more if needed. Is the palm oil applied to hair immediately after shampooing and applying a leave in conditioner, and is it applied to the scalp and hair strands or hair strands only? The oil I use is not pale or orange. Just like most natural foods the color will vary. This article is to introduce those to a oil they may not of thought of using. Either you like it as a hair oil or not.